Jupiter is the largest and most massive planet in our solar system, more massive than all the other planets combined, nearly 318 times the mass of the earth. We know now that other Jupiter-size planets exist in other solar systems, so that the formation of large, massive planets like Jupiter may be fairly common, and may play a key role in the formation of planetary systems. Jupiter, a bright naked-eye planet, is itself is largely a mystery. Jupiter's atmosphere is distinguished by swirling, banded ammonia clouds, and the famous Great Red Spot, an enormous cyclonic storm bigger than two earths. The 9.8 hour Jovian day is the shortest of any major planet. Jupiter's fast rotation helps power a strong magnetic field, which traps charged particles from the sun and produces a beautiful light show near the north and south magnetic poles. This light-show is Jupiter's aurorae, its larger version of the earth's Northern and Southern lights. Jupiter's aurorae, like earth's aurorae, are produced when high energy particles from the solar wind are trapped by the planet's magnetic field and funnelled towards the north and south magnetic poles, where they interact with atoms in the planet's atmosphere. When these energetic solar-wind particles collide with the atoms in the atmosphere near the magnetic poles, they energize electrons, which then lose energy, producing the auroral light. In the case of Jupiter, these interactions are so energetic that they produce high-energy X-ray emission. 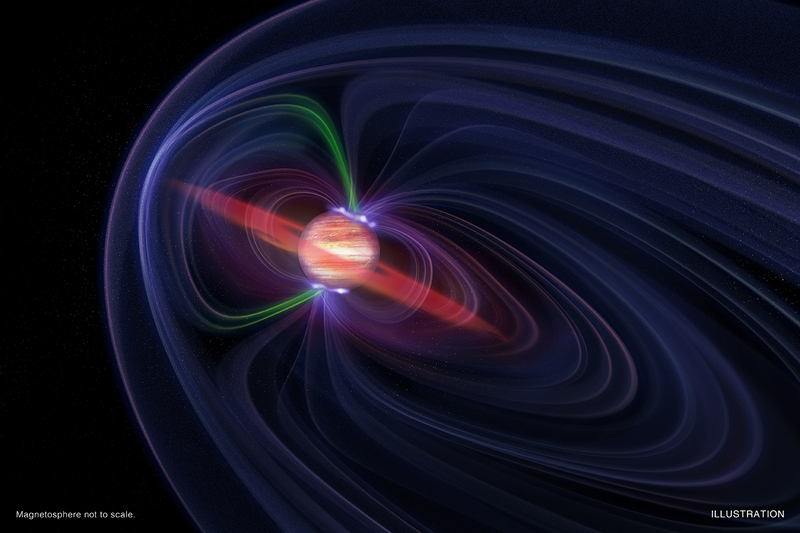 In fact, Jupiter is the only planet we know of which possesses an "X-ray aurorae". The image above shows a composite of an optical image of Jupiter, taken by the Juno orbiter, and Jupiter's Southern X-ray aurora as viewed by the Chandra X-ray Observatory. In addition to the mysterious origin of the X-ray aurorae on Jupiter, new observations with Chandra and the XMM-Newton X-ray Observatory also show that, for some reason, the northern and southern lights on Jupiter behave independently from one another: the southern aurora varies with an 11-minute timescale, while the northern aurora seems to vary randomly. This is unlike earth, where the northern and southern lights tend to behave in concert. New observations with Juno, and with Chandra and XMM-Newton, will provide important new details to unravel the mysterious interplay between Jupiter's strong magnetic field, the solar wind, and the planet's atmosphere.